Practically woven into the hanging moss and knotted tree roots of New Orleans are legends of spirits. Whispers of ghost sightings and brushes with voodoo hang as heavy as the mist in the city’s humid air. The history of the Big Easy, like the rest of the city’s culture, is rich. That varied history lends itself to centuries of unsettling tales: men lingering long after their demises; men possessed; men suspiciously succumbing to the lure of death. As locals know, food and fright casually intermingle at a number of restaurants and residences in the city’s quarters. 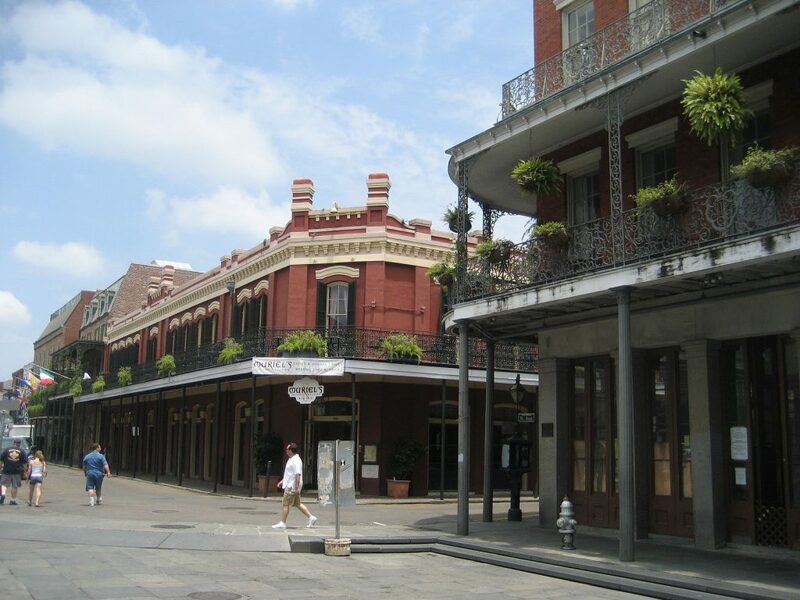 One of the most notable of these haunted dining establishments is Muriel’s Jackson Square in the French Quarter. An early plan of New Orleans and its grid system. Photo source. Before Muriel’s Jackson Square opened to the public in 2001, the land the restaurant sits on went through a string of owners and tragedies. In 1718, Jean-Baptiste Le Moyne de Bienville founded the city of New Orleans, then known as Ville de la Nouvelle Orleans. A French Canadian named Claude Trepagnier was granted the land that would later become Muriel’s for his efforts as a member of Bienville’s expedition party. On his land, Trepagnier constructed a small cottage that has since been rumored to have held slaves awaiting auction. Because of this reputation, some clairvoyants in the city believe Muriel’s, and its surrounding area, are home to many “troubled spirits.” These spirits were likely servants or slaves. 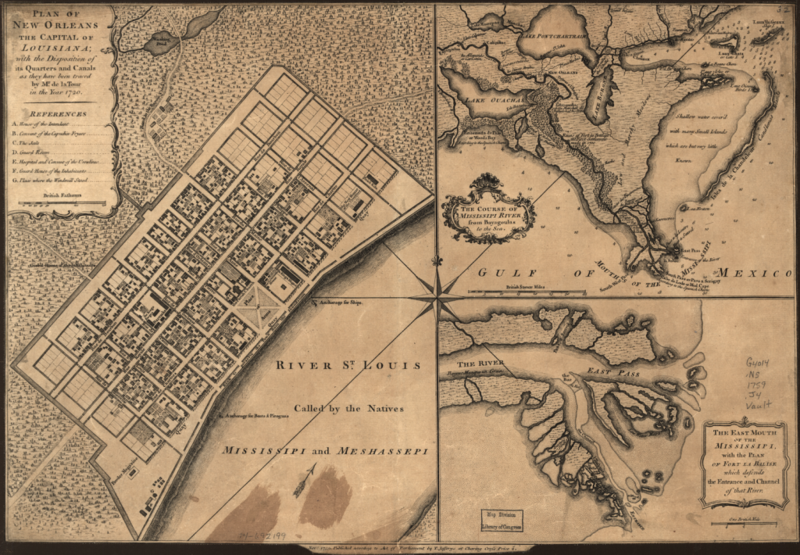 In 1721, New Orleans was laid out into a grid. The Place de Armes, or “parade grounds,” was at the center of this grid. Eventually, these grounds became Jackson Square. Because of the arrangement of this grid, Trepagnier’s house became a coveted plot of land, especially due to its proximity to a cathedral. To the devout French settlers, the cathedral was the center of the town. Later on, between 1743 and 1762, another Jean Baptiste, Jean Baptiste Destrehan, acquired the land. Destrehan was the Royal Treasurer of the French Louisiana Colonies. Accordingly, he was wealthy and powerful. He destroyed the modest, mostly wooden cottage. In its place, he built a palatial residence. The residence was constructed to be worthy of his status. Destrehan added, among many other rooms, a music room, drawing room, and ballroom. He filled the 5-bedroom house with luxurious, imported goods. Money was no object. In 1765, Destrehan passed. His son later inherited the house. Once the well of the Destrehan family money ran dry, a new owner, Pierre Phillipe de Marigny, purchased the property at auction. Marigny used the house as one of his more urban residences, or “city homes,” compared to his plantation further away from the city center. 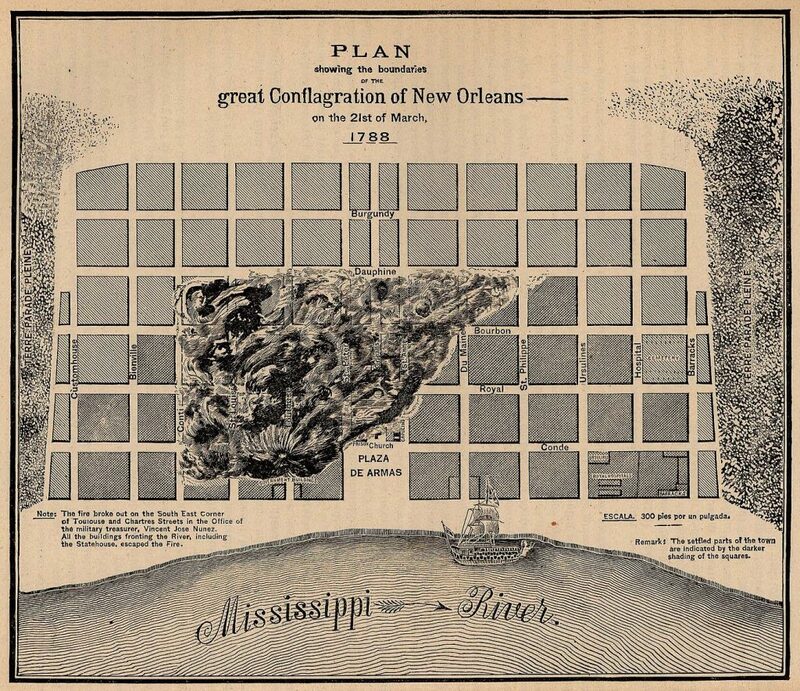 On Good Friday 1788, New Orleans burned. An 1886 map showing where the Great Fire of 1788 broke out. Photo source. The Great New Orleans Fire burned 856 out of the 1,100 buildings in the French Quarter, including part of de Marigny’s mansion. Over the following decade, the city was gradually rebuilt. The Spanish replaced the charred wooden buildings with brick. The St. Louis Cathedral, one of the defining landmarks of the city, was built during this reconstruction period. As for the Bienville-Destrehan-Marigny property, yet another owner took over the residence. This owner would later prove to be the most significant, at least with regards to the property. This new owner, Pierre Antoine Lepardi Jourdan, restored what was left of the estate. Jourdan enjoyed his palace immensely, but he was a gambling man. In 1814, he bet the house, literally, in a game of poker. He lost. This loss devastated Jourdan. He immensely loved the home he’d made for himself and his family. Rather than having to abandon and forfeit his home, he made a final decision. He committed suicide. In 1823, after Pierre Antoine Lepardi Jourdan’s death, the house had yet another new, influential owner important to the city’s history, Julien Poydras, President of the Louisiana State Senate, a Director of the Louisiana Bank, and owner of a half-dozen plantations. Like Destrehan, Poydras was a man of wealth and power with expensive, elite tastes. Incidentally, a year after moving into the residence, Poydras fell ill and died. The surviving Poydras family continued to live in or own the property throughout the following years and the Civil War, until its ownership changed hands, yet again, as the Poydras family lost wealth and power after the war. The next owner, Theodore Leveau, owned the property from 1881 to 1891. Outside of the Poydras family, the city of New Orleans experienced a number of post-war changes. The French Quarter was no longer a place of wealth and glamor, but a vestige of the pre-war past. The new neighborhoods of wealth and power, the Garden District and Uptown, were in the city’s American Sector, not the Quarter. Following Leveau, the property was subsequently purchased by Peter Lipari. Lipari remodeled the structure to its present form, establishing it as a commercial, rather than residential, space. A restaurant and saloon shared the remodeled space. Then, later, under Frank Taormina—yet another owner—a pasta factory and grocery store replaced them. In the 1970s, the commercial space finally changed into solely a restaurant. In 2001, this restaurant, then known as Chart House, became Muriel’s, under its current owners. The most dedicated owner of the Muriel’s property, Pierre Antoine Lepardi Jourdan ended his life on the second floor of the building. The second floor was where slaves were once quartered, and is now Muriel’s Seance Lounge. 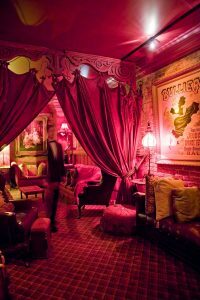 The space became the Seance Lounge due to the spiritual presences that still remain from the floor’s melancholic history. Since his death, Jourdan still lives on in Muriel’s. His legacy lives on not only in the restaurant’s stated history or ownership records, but far beyond that—Jourdan’s very spirit resides in Muriel’s. His ghost, described as “a glimmer of sparkly light,” spends most of his time on the second floor, but he is also known to visit the remainder of the restaurant. At times, objects have been seen floating through the restaurant, ostensibly at random. This is thought to be a sign of Jourdan’s ghost passing through the space. Jourdan is the chief resident spirit of Muriel’s, but not the only spirit. In Muriel’s Courtyard Bar, another ghost, known to have a bit of a rowdy sense-of-humor, has wreaked minor havoc on patrons. Since March 2001, on three separate occasions, bar glasses have been hurled 12 feet from the bar across to a brick wall and broken, with no live, human visitor responsible, according to accounts from Muriel’s co-owner, managers, and patrons. Along with glasses, a full bottle of wine is said to have been flung and shattered by a ghost. 1) Ghostly servants who, in the afterlife, are still attending to their master, Jourdan, broke the glasses to let off steam from the frustration of their eternal servitude. 3) These were attempts by Jourdan himself to communicate with mortals he considers family, or to fully cross over to the other side. The Seance Lounge at Muriel’s Jackson Square. Photo source. The International Society for Paranormal Research designates Muriel’s as one of New Orleans’s most haunted sites. Several paranormal investigations have looked into the spiritual presence at Muriel’s. These investigations report sightings of inexplicable shadows seemingly emitting disembodied voices. The Seance Lounge is the center of paranormal activity in Muriel’s, as most of these sightings have occurred within their walls. A distinctive pattern of knocking on the walls sounds in the area at times, in what may be ghost(s) trying to communicate with mortal guests. A woman’s voice has also been documented as being heard while no living women were in the area. Despite the unsettling nature of these reports, Muriel’s assures its patrons that its known resident ghosts are harmless; no restaurant patrons who’ve encountered a ghost have said they were scared by them. Jourdan’s table at Muriel’s Jackson Square. Photo source. 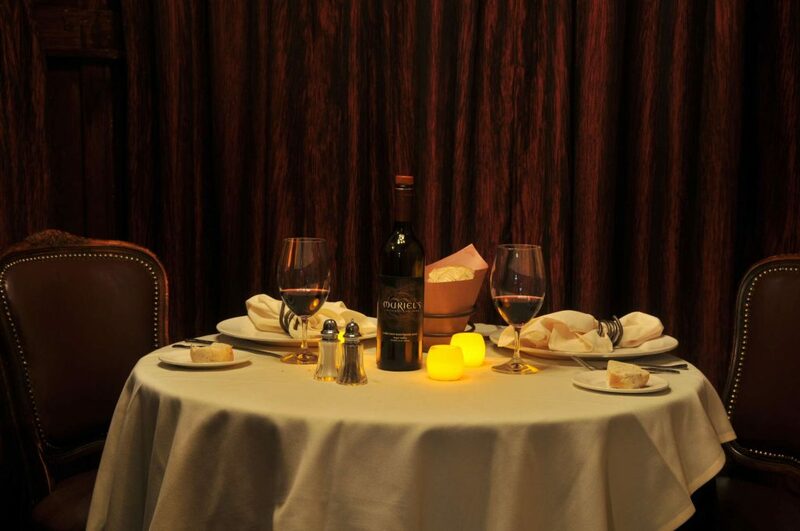 Muriel’s welcomes and stands by its ghostly guests, especially Jourdan, to the point of keeping a table permanently reserved for his ghost, complete with bread and red wine. The restaurant sets his table every day. A daytime view of Muriel’s Jackson Square. Photo source. A fully operational and renowned restaurant, Muriel’s Jackson Square is open to the public. Guests are welcome to visit the Seance Lounge and see Jourdan’s table when the restaurant is open. After you pay Muriel’s (and Jourdan) a visit, consider joining us on our New Orleans Ghosts tour. Our nightly tour meets and ends at the St. Louis Cathedral, right by Jackson Square. St. Louis Cathedral is a short, one-minute walk from Muriel’s Jackson Square, making it easy to experience both on the same night. Though the ghosts at Muriel’s are friendly and good-natured, the spirits who may appear in our journey through the haunted side of New Orleans are decidedly less so. Feingold, Taylor. “Living Among The Dead: Muriel’s Jackson Square.” WGNO, WGNO, 27 Oct. 2017, wgno.com/2016/10/17/living-among-the-dead-muriels-jackson-square/. “Haunted Nola: Muriel’s Eternal Guest.” WDSU, WDSU, 10 Oct. 2017, www.wdsu.com/article/haunted-nola-muriels-eternal-guest/12780661. “Our Ghost.” Muriel’s Jackson Square, Muriel’s Jackson Square, 2015, muriels.com/about/ghost/. “Our History.” Muriel’s Jackson Square, Muriel’s Jackson Square, 2015, muriels.com/about/history/. “Séance Room at Muriel’s Jackson Square.” Atlas Obscura, Atlas Obscura, 4 Nov. 2016, www.atlasobscura.com/places/muriels-ghost-at-jackson-square. Times-Picayune, NOLA.com | The. “New Orleans Haunted Restaurants Draw Spirited Diners.” NOLA.com, NOLA.com, 18 Oct. 2012, www.nola.com/dining/index.ssf/2004/10/new_orleans_haunted_restaurant.html.